Historic Saint Michael the Archangel Cathedral here is one of two Diocese of Alaska churches on this year’s “Ten Most Endangered Historic Properties” list compiled by the Alaska Association for Historic Preservation [AAHP]. Also on this year’s list is the Ascension of Our Lord Church, Karluk, AK, which was built in 1888. Located on the far side of Kodiak Island, the Karluk church is considered the state’s oldest extant Orthodox sanctuary. Saint Michael Cathedral was constructed between 1844 and 1848. Saint Innocent Veniaminov designed the structure and built the clock that graces its bell tower. 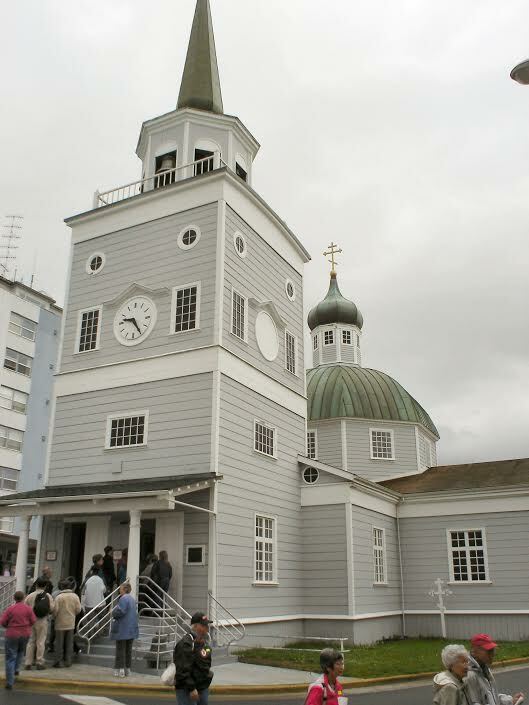 He hired skilled Finnish carpenters to build the cathedral, which was made of spruce logs and ceilings with sailcloth-lined walls for insulation and improved acoustics. The cathedral was the principal physical representation of the Russian cultural influence in the 19th century in North America. From 1840 to 1872, Sitka was the See of the Diocese that governed all of North America, and thereafter it continued as the See of the Diocese of Alaska. The present cathedral is a faithful reconstruction of the original building which burned to the ground on January 2, 1966. Fortunately, over 95% of the original icons, pieces of Orthodox liturgical art and religious objects—including the Sitka Icon of the Mother of God—survived the blaze. The AAHP has compiled this annual list since 1991. It is intended to bring public awareness to Alaska’s threatened historic properties. Heightened awareness often leads to increased support for the conservation of endangered historic properties, which are assets important to religious life, tourism, economic development and Alaska’s cultural heritage. The nominations for this program are submitted by individuals and organizations throughout Alaska. The list is the first step to participate in the AAHP’s “Ten Most Endangered Grant Program,” which funds hands-on preservation work on endangered properties and serves as seed money to leverage funding from other sources. Properties listed on the 2016 list will be eligible to apply to AAHP for these matching grants, which are made possible through generous donations to the Grant Program from private individuals and organizations which support these preservation efforts.